Google is making a whiteboard, did you know? The search giant announced the Jamboard back in October of last year, and now it's finally available for purchase. This, however, isn't a product meant for at-home use. It's aimed at workplace scenarios, and it's obviously not just a whiteboard. 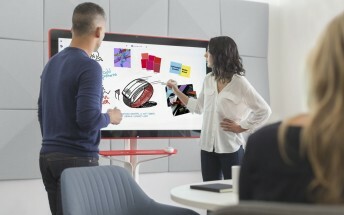 Essentially, you're getting a 55-inch 4K touchscreen computer running a special whiteboard app on top of Android. It has an optional rolling stand, and it comes in three colors: cobalt blue, carmine red, and graphite grey. If you're in the US, you can now order a Jamboard for $4,999. For this amount of cash you're also getting two styluses, one eraser, and one wall mount. The rolling stand costs $1,199 until September 30, after which it will go for $1,349. The annual management and support fee for the Jamboard is $300 per year (on or before September 30, 2017), and $600 per year after that. A paid G Suite plan is required to use Jamboard. The device is making its way to Canada and the UK "this summer", and it should become available in more countries after that.